If you're looking for quick-to-prepare meals, or just a comforting dish at the end of a rough week, egg noodles and pasta can fit the bill. Both are made from a mix of wheat and eggs, and you can substitute egg noodles in place of regular pasta in recipes. However, as their name implies, egg noodles contain a higher proportion of eggs to wheat than regular pasta. The two pastas share several nutritional similarities, but offer slightly different amounts of some minerals and vitamins. A cup of either cooked pasta or cooked egg noodles boosts your energy intake by 221 calories -- 11 percent of your daily intake in a 2,000-calorie diet. In both cases, carbohydrates account for most of these calories, and pasta and egg noodles contain 43 and 40 grams of carbohydrates per serving, respectively. Pasta offers slightly more fiber per serving, at 2.5 grams, compared to egg noodles' 1.9 grams. Each serving of pasta provides 10 percent of the daily fiber intake recommended for women and 7 percent for men. 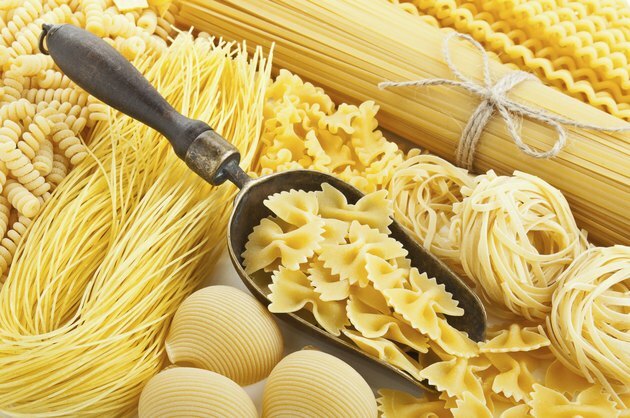 Pasta also contains slightly more protein than egg noodles -- 8.1 grams, compared to 7.3 grams. This protein keeps your hair strong and healthy and nourishes your bones and skin. Egg noodles and pasta offer roughly comparable amounts of selenium, a trace mineral your cells need for enzyme function, but egg noodles offer more magnesium. Selenium activates enzymes that fight cancer development, maintain healthy blood vessels and promote the proper function of your thyroid gland. A serving of either pasta or egg noodles provides roughly two-thirds of the selenium you need in a day. The magnesium in egg noodles and pasta also activates enzymes, including those needed to make DNA and produce energy. A serving of egg noodles offers 34 milligrams of magnesium -- 11 percent of the recommended daily intake for women and 8 percent for men -- while pasta offers 25 milligrams per serving. Egg noodles also offer slightly more niacin and folate -- vitamins B-3 and B-9, respectively -- per serving compared to pasta. Niacin makes up a component of coenzymes that aid in energy production, and it also controls gene activity in your tissues. Folate helps you produce DNA and protein, which makes it essential for healthy cell growth. Each serving of egg noodles offers 3.3 milligrams of niacin -- 24 percent of the daily intake recommended for women and 21 percent for men -- as well as 134 micrograms of folate, or one-third of the daily recommended intake. A serving of pasta contains just 2.4 milligrams of niacin and 102 micrograms of folate. Use egg noodles or pasta as a base for healthful meals. Combine pasta with roasted red peppers, basil pesto and chopped kalamata olives for a vibrant and colorful dish, or mix egg noodles in a pumpkin sauce -- made from pureed pumpkin, fresh sage, olive oil and a dollop of Greek yogurt -- for a comforting dish. If you plan to substitute egg noodles for pasta in your recipes, use 2 cups of dry noodles for each cup of cooked pasta, recommends the University of Nebraska at Lincoln. For example, if your recipe calls for 2 cups of cooked pasta, use 4 cups of raw egg noodles.